Warning this is an really really OLD Tutorial updated last for blender2.2x if you are complete beginner and can’t navigate blender well then I would recommend you to blender wiki. I modeled this car to learn the modeling of one of my favorite machines. 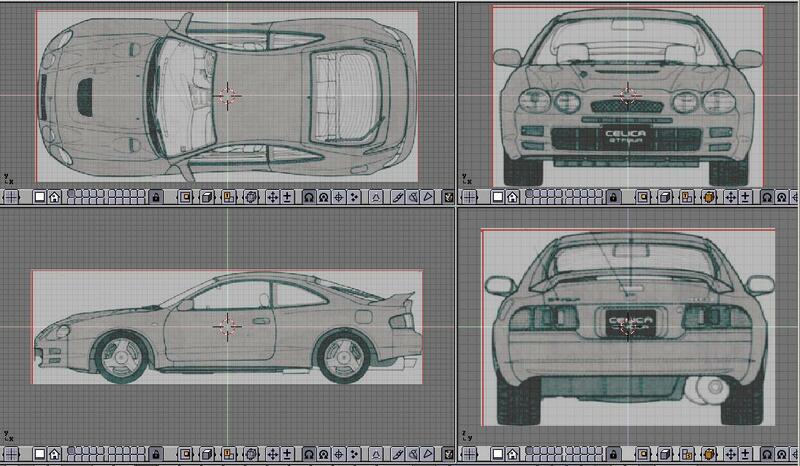 Modeling a complete car first time is quite complex. I did achieve satisfactory results from it in terms of quality and experience :), but the results could have been better. I have described the steps through which I modeled this car and I release this tutorial in a hope it will benefit someone. Since this is the intermediate level tutorial I expect people to complete the in between step themselves. In any case, the start up’s will definitely benefit from it. This tutorial was done for blender, but I think it can easily be applied to other modeling packages. 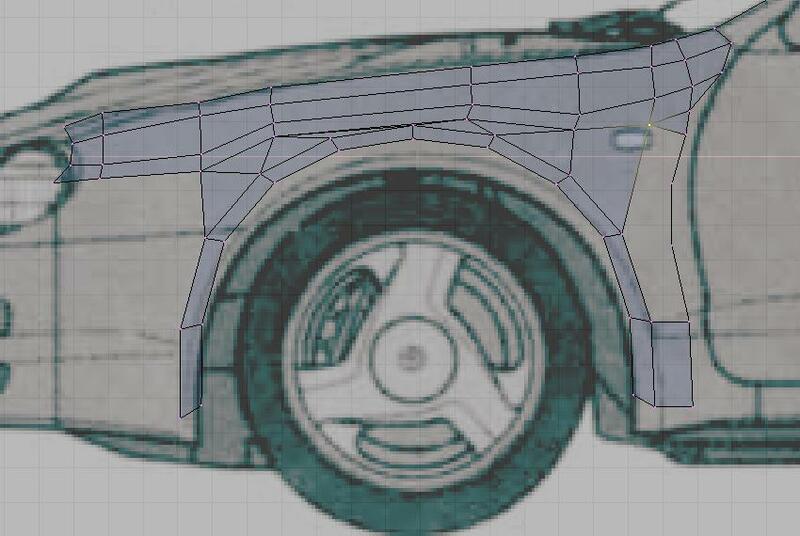 Since most of the cars have a symmetric body on both sides we can just model single half of the car and upon completion can mirror and join the meshes to get the full mesh. Step-1. The first thing to remember prior to start modeling is to get the blueprints and anyother references (photographs) for the model ready. I myself did not search for the photographs of Toyota Celica model as I was too anxious to start. I, however eventually I got the blueprint from http://www.suurland.com. It is recommended to look at more resources for the model as it is likely that you will get the better idea of its shape and form. The second step is to set them up in Blender viewports like the Image2 below. I used four viewports one for each side of the blueprint. It helps to correctly visualize the contours of the surface during modeling as you can see most of the blueprints offer views from the top, left, back and front. Cut images in same proportions in an image editor like Gimp. To bring images into viewport background do this. Keep your mouse over the viewport and press ‘Ctrl+F7‘ (Depreciated shortcut in Blender 2.3x above instead click on the view>> Background Image) a window will pop up, locate the path for the images of the blueprint. Repeat this step for all four images. Your blender window will look something like Image2. Before loading images (blueprints) make sure they are matched equally in resolution otherwise you will have to adjust the size in the background properties, and this may not produce good results. Also, make sure you have grids in every plane is centered (press C). Step-2. Ok done that now what? 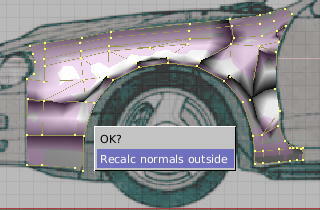 There can be different approaches to starting modeling the car body. 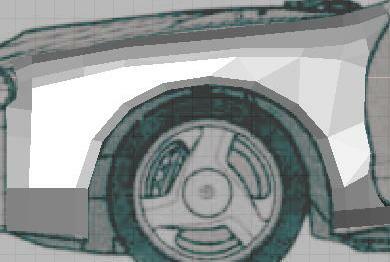 I choose to model the front side of the car body which covers the tyre (we will call it front_fender from now on). In top view port place a square mesh and extend it along the contour of the front_fender (towards left in top view Image3) first in the top view port and then adjust it in other viewports. If you are new to modeling then for you this may seem difficult to switch between the viewports but it is a good idea to work and see the changes in other viewports at the same time because every now and then the mesh will get distorted. By observing and a little patience, you will enjoy it gradually. After few extrusions, your mesh will look like as in Image3. Now since we will be using Sub-Surf we need to have very less number of edges. The reason for a lesser number of divisions in the mesh is that sub-surf will handle the smoothness for us. Try to observe the effect on the mesh the Sub-surf function have by switching it on and off (Press F9 and locate Sub-surf in Buttons Menu). Adjust the curves of the mesh by tracing the background image with the minimum required lines/divisions just to get underlying shape in correct proportion. Having lesser divisions also helps to have a clean mesh which makes later stage modifications fun and easy. 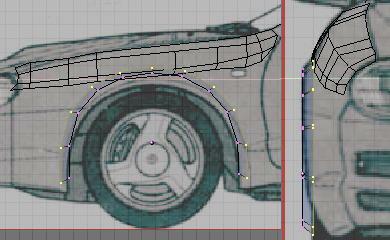 Select outer vertices (edge) of tyre_cover and extrude it towards the tyre area following the shape of the car body seeImage4. To maintain the contour of the mesh again follow it in other viewports. Image4. Extrusion of the outer edge (Top View). Step-3. Now we will make tyre cut out in the front_fender mesh. After Step-2 left click just above the end of the tyre-cover to place the cursor (see Image-5a). Get into Side view and place the cursor at the middle of the tyre (see Image5b). Add a circle of 16 vertices. In the Fig I had exited the mesh edit mode before adding the circle but you can do it in edit mode also. 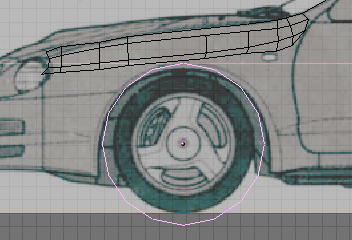 The circle will provide a good starting point to make the tyre cut out in the front_fender mesh. Image5a. Cursor position in the top view. Image5b. Circle added at the center of the tyre in the background image. Select the circle mesh and get into edit mode (if you did it the way I did it i.e. kept both meshes separate) adjust it in the side view till it fits the shape of the tyre cut out for the front_fender body. Remove the vertices we do not need see Fig-6a. 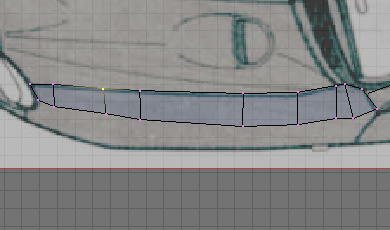 Now select all left vertices get into front view (Image6b) and extrude once towards the front_fender mesh. Scale it a bit and move upwards so that the bottom vertices are in straight line. Image 6a 6b. Editing the tyre cut inside view. Extruding towards the engine (front view). Step-4. Get out of edit mode and go into side view port. Select and Join both the meshes (‘Ctrl+J’) (No need if you added the circle in Edit mode of front_fender mesh). 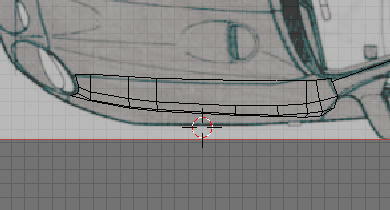 After joining, we need to add faces between the circle and the front_fender mesh. Get into Edit mode select judicially three or four (desirable) vertices then press “F” to add a face between them, follow the Image-7a for help. After joining the middle part of the circle, you can extrude the faces from the bottom part of the circle and do some join and face creation to get the complete mesh. if you need to add new independent vertices you can use “Ctrl+Right click” combo. Follow the above methods to get the mesh like in Image-7b. Go through all the viewports to adjust the vertices so that proper contour of the front_fender mesh is retained as in the blueprint. Image7b. 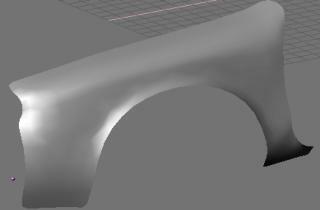 Shaded view of the mesh after adding all the faces for the front_fender mesh. Step-5. The front_fender mesh is now almost complete. We will see it using Sub-Surfaces enabled and check for any visible deformations. Get out of Edit mode and select the mesh and press the Sub-Surf button. It will get smoothed and bit rounded towards the edges but that’s ok right now. Press the smooth button now. oops! What are those black patches doing there? (Don’t worry those are not any defects in the mesh 😉 Well do not worry just go into edit mode select all vertices by pressing ‘A’ then press ‘Ctrl+N’ and confirm the pop-up to clear normals see Image8a. Image8b – After all normals point in one direction.